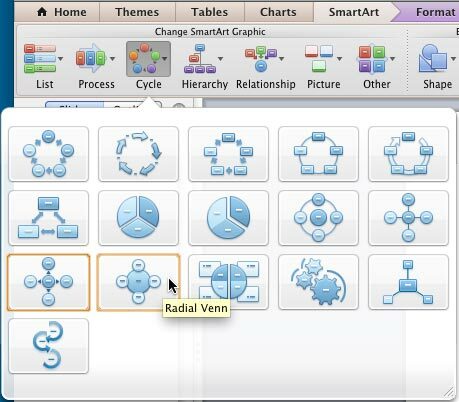 Excerpt/Capsule: Learn how to change from one SmartArt graphic layout (type) to another in PowerPoint 2011 for Mac. Select your existing SmartArt graphic, as shown in Figure 1. 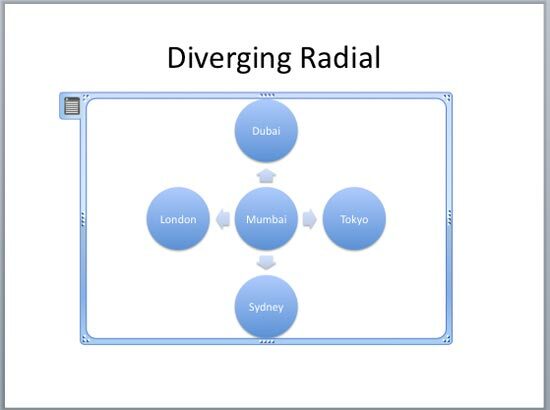 The SmartArt graphic variant that has been used here (and selected) is the Diverging Radial. With the SmartArt graphic selected, click on the SmartArt tab (highlighted in red in Figure 2). 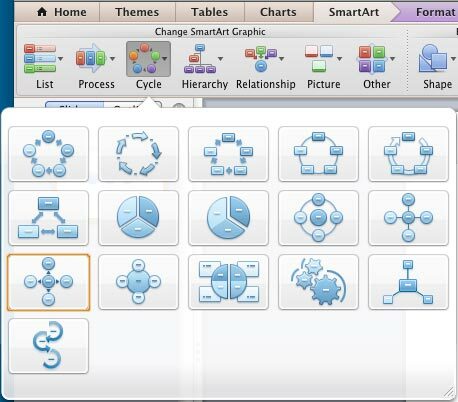 Within this tab locate the Change SmartArt Graphic group which includes buttons representing various categories of SmarArt. Clicking any of these buttons will open a drop-down gallery displaying SmartArt graphic variants of that particular category. In Figure 3 you can see the Cycle category's gallery. Note that your current SmartArt type is highlighted with dark yellow border (see Figure 3 above). To change the SmartArt type, just click on another preview thumbnail that represents a different layout that you see in the drop-down gallery (see Figure 3). 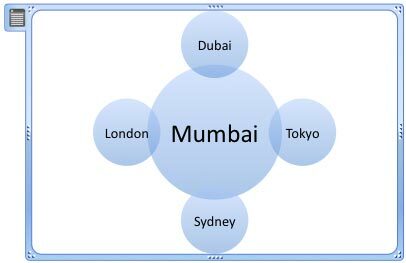 In Figure 4, you can see that we have selected the Radial Venn type. Tip: You can also select any SmartArt type - but do give a thought that your new type (layout) matches the type of relationship or logic that you want to illustrate. In Figure 5 you can see that the selected SmartArt graphic's layout has changed form Diverging Radial to Radial Venn (compare Figures 1 and 5).